This weekend New England Aquarium visitors have the chance to meet some special youngsters. In addition to the sea lion and fur seal pups, there are three beautiful guitarfish in the warm water exhibits on Level One. These fish are elasmobranchs along with other sharks and rays. Their skeletons are composed of cartilage rather than bone, kind of like your ears and nose. Take a look. 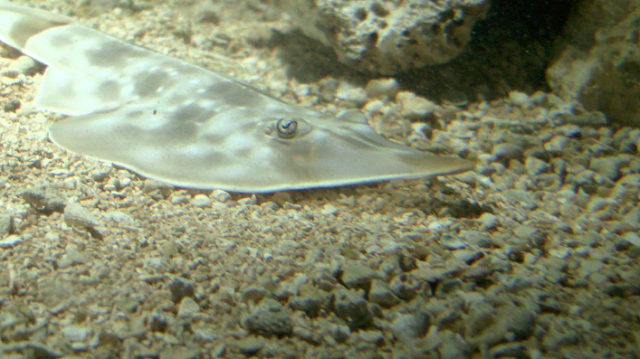 The Atlantic guitarfish (Rhinobatos lentiginosus) seem to be settling into their new exhibit quite well! These fish can grow to be more than two feet long (76 cm)! They are bottom feeders, eating mostly mollusks and crustaceans. Atlantic guitarfish are considered near threatened by the IUCN Red List. You won't find these fish soloing on stage in the spotlight, but it's not hard to imagine how they got their name. Come visit this holiday weekend to watch these special animals in person!